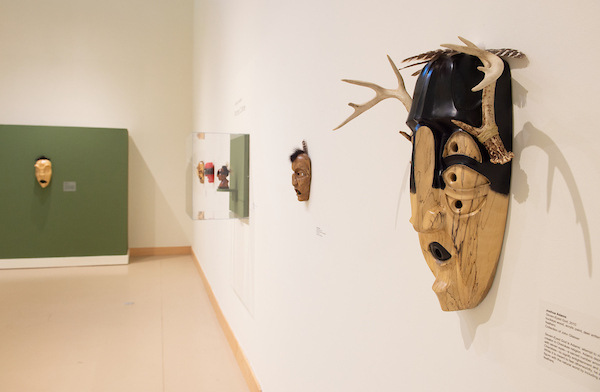 The exhibition brings together a selection of masks and carvings of the human face by Eastern Band Cherokee artist Joshua Adams, who expresses a deep reverence for his culture through his artwork. A teacher of woodcarving at Cherokee High School, Adams' work reflects on the importance of preserving his culture and how outside influences have, and still do, impact Cherokee life and belief. Intended for display rather than ceremony, these representations of the human face range from traditional Cherokee forms to contemporary twists on tradition. Made from a variety of woods with details fashioned from rabbit fur, feathers, porcupine quills, and traditional arrows, Adams' works demonstrate the technical complexity of mask making and the array of materials that enliven this artform. Sculptors, wood carvers, historians, craft enthusiasts, and those interested in Cherokee art and culture will not want to miss this exhibition. Posted on July 21, 2018 by Joshua Adams.